Includes the names: William Penn, William Penn, BY (AUTHOR): WILLIAM PENN . 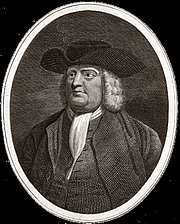 William Penn, a Quaker (then a persecuted minority in England), appealed to the Crown to permit a mass migration of Quakers to the English colonies in North America. As the Puritans in New England were hostile towards them, the Quakers needed a new area to settle. King Charles II granted Penn a charter that made him the world’s largest private non-royal landowner, with over 45,000 square miles south of New Jersey and north of Maryland that became Pennsylvania. William Penn is currently considered a "single author." If one or more works are by a distinct, homonymous authors, go ahead and split the author. William Penn is composed of 4 names. You can examine and separate out names.